The diadinoxanthin cycle (DD-cycle) in chromophyte algae involves the interconversion of two carotenoids, diadinoxanthin (DD) and diatoxanthin (DT). We investigated the kinetics of light-induced DD-cycling in the marine diatom Phaeodactylum tricornutum and its role in dissipating excess excitation energy in PS II. Within 15 min following an increase in irradiance, DT increased and was accompanied by a stoichiometric decrease in DD. This reaction was completely blocked by dithiothreitol (DTT). A second, time-dependent, increase in DT was detected ∼ 20 min after the light shift without a concomitant decrease in DD. DT accumulation from both processes was correlated with increases in non-photochemical quenching of chlorophyll fluorescence. Stern-Volmer analyses suggests that changes in non-photochemical quenching resulted from changes in thermal dissipation in the PS II antenna and in the reaction center. The increase in non-photochemical quenching was correlated with a small decrease in the effective absorption cross section of PS II. Model calculations suggest however that the changes in cross section are not sufficiently large to significantly reduce multiple excitation of the reaction center within the turnover time of steady-state photosynthetic electron transport at light saturation. In DTT poisoned cells, the change in non-photochemical quenching appears to result from energy dissipation in the reaction center and was associated with decreased photochemical efficiency. D1 protein degradation was slightly higher in samples poisoned with DTT than in control samples. 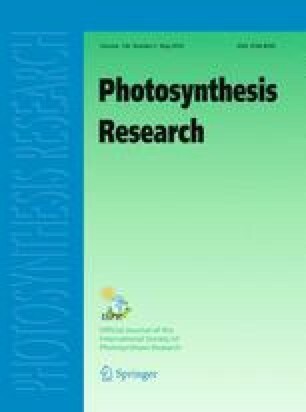 These results suggest that while DD-cycling may dynamically alter the photosynthesis-irradiance response curve, it offers limited protection against photodamage of PS II reaction centers at irradiance levels sufficient to saturate steady-state photosynthesis.